EcoPallets is the exclusive provider of Green Ox® Pallet Technology in Kenya, Tanzania, and Uganda and offers the 1m x 1m Green Ox® corrugated pallet to businesses looking to reduce costs while minimizing their environmental impact. Green Ox corrugated pallets can be used in most of the same applications as wood or plastic pallets, and offer a very clear advantage when used for air-freight shipments where weight is critical to cost. We work closely with each of our clients to ensure a good product-fit, and look forward to showing how Green Ox pallets can work for your business! 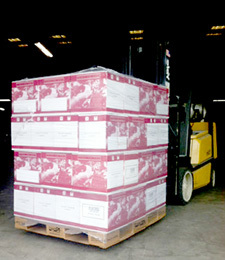 To learn more about Green Ox® Pallet Technology, please browse this Web site. 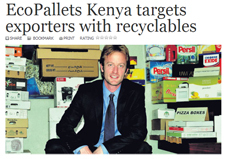 If you would like more information on EcoPallets Kenya or to place an order, please contact us. *Recommended load weights are evaluated on a case-by-case basis based on load weight/distribution, load configuration, shipment type, unitization, and pallet use.